SPRUCE CREEK, FL - The 2009 Spruce Creek Fall Carnival was held this Saturday October 31 at Windsock Park (at "The Tree"). This year, the popular event coincided with Halloween for a veritable full day of children activities. Organized by the Spruce Creek Children and Recreation Committee, this year's festival was chock full of activities for children of all ages. Activities included Crafts, Face Painting, Balloon Art, Pumpkin Decoration, Ring Toss, Bounce Houses and Inflatable Obstacle Courses. The traditional hay ride was also there giving a tour around Cessna Boulevard. This year there were also horse and pony rides for the kids. All activities were free of charge and manned or funded by residents of the Spruce Creek Fly-In. Plenty of food was also provided free of charge and included hot dogs, soft drinks, snow cones, and of course, Halloween candy. The Pie Contest booth included samplings of the best pies that Spruce Creek residents have to offer. There was also a wine tasting station sponsored by a local retailer and the always present Southeast Volusia Humane Society exhibit which brought several lovable dogs available for adoption. 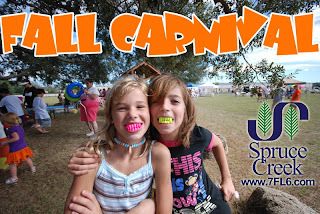 The Fall Carnival is one of the many children activities organized each year by the Spruce Creek Children's Recreation Committee. The Committee is managed by volunteer residents of the Spruce Creek Fly-in. The mission of the Committee is to provide safe, fun and healthy activities and opportunities for the children and families of the Spruce Creek Fly-in community. Funding for the activities is provided by the residents of Spruce Creek and donations from local businesses. Other activities held throughout the year include the Annual Spruce Creek Easter Egg Hunt, Family Movie Night, Summer Bash, Breakfast with Santa as well as many other events organized in conjunction with the famous Spruce Creek festivals: Spruce Creek Wings and Wheels, the Annual Spruce Creek Bonfire, the Spruce Creek Toy Parade, and the Daytona Beach Hot Air Balloon Festival. The Spruce Creek Fly-in Community is the world's most famous residential airpark. With a 4,000 ft lighted runway and a GPS approach, the private airport at the center of the community (7FL6) can accommodate anything from a Stearman to a Gulfstream. Originally a navy airfield during WWII, it evolved into the world's largest residential fly-in community. Today, almost 5,000 residents, 1,300 homes and 700 hangars share a unique life in this private gated village. The championship Spruce Creek Golf Course and Country Club and 24-hr patrolled security complement the safety, privacy and enjoyment of the residents. John Travolta and many other celebrities have enjoyed the Spruce Creek Fly-In lifestyle and privacy. The first thing a visitor sees after driving through the security gates is a sign that summarizes the spirit of this community: “Caution children and adults at play”.